The Love Media building in GTA III. 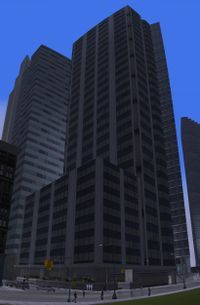 The Love Media Building is an approximate 30-story skyscraper situated at the southernmost end of Bedford Point, Staunton Island in Liberty City in Grand Theft Auto III and Grand Theft Auto: Liberty City Stories. The height of this is 219 m (718,5 ft). In GTA III, the building is owned by Donald Love, and is the suggested headquarters for Love Media. It is also the fourth tallest building in Bedford Point. During the course of the game Claude comes the building to receive missions from Donald Love. As seen in all mission cutscenes, there is an ambient Asian garden set at the very top of the skyscraper. The garden is used by Donald, and the Old Oriental Gentleman as a setting for practicing Tai Chi. The rooftop has many amenities such as a treadmill, two penthouses, bonzai trees, and a small pond. The rooftop garden in GTA III. The rooftop while normally inaccessible during normal gameplay can be accessed by use of the Dodo, flying car cheat, or modification. If accessed everything but the ground is unsolid in contrast to the cutscenes. In GTA Liberty City Stories, the building is still present but doesn't feature the rooftop garden. It is implied that it might be owned by Love because the hearse in the mission, The Morgue Party Candidate, must be dropped off in Love's underground garage in the building. This page was last modified on 6 November 2011, at 19:52.